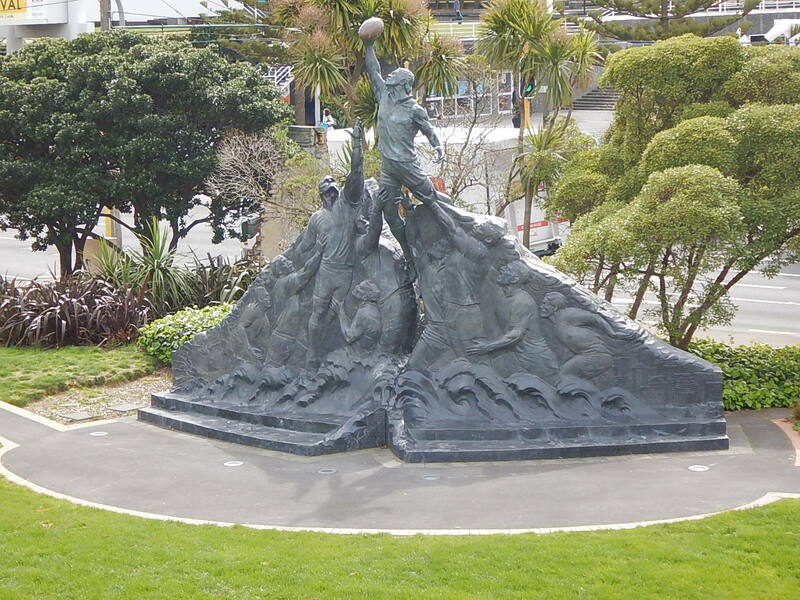 We left Napier on Monday and took Highway 2 south to Wellington, capital of New Zealand. We had quite a lot of ground to cover and the car had to be returned to Hertz by 17.00 so we didn’t have much time to spare but several people had recommended the Mount Bruce Wildlife Centre and Kiwi Sanctuary so we planned to stop there en route. Highway 2 follows the line of the Ruahine Range so as we drove across the plains of the Hawkes Bay region through wine territory and later through farmland we could see the mountains rising west of our route, some still had snow on them so they were quite a sight. We stopped for a break in Dannevirke and found a lovely café in a converted bank where coffee and cakes set us up for the rest of our drive. 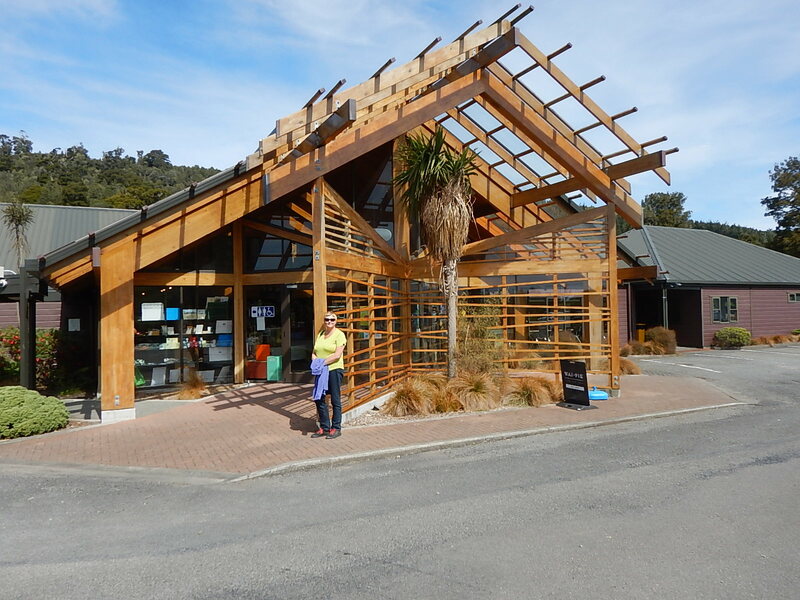 Next stop was the wildlife centre, we figured we could spare an hour there if we were going to reach Wellington on time. The main reason we wanted to visit the centre at Mount Bruce was to try and see a Kiwi, they are extremely rare and nocturnal so it is virtually impossible to see one in the wild; Mount Bruce has a special Kiwi enclosure with two occupants, a brown Kiwi and, rarest of the rare, a white Kiwi. It is a large enclosure creating a forest floor environment (lots of undergrowth and fallen timber) and simulated nigh time, they offer no guarantees that you will spot a Kiwi but we were happy to give it a go. When we arrived we were told we had 15 minutes until the feeding of the KawaKawa, another very rare native bird and the only one in captivity, rather than hanging around we decided to duck into the Kiwi enclosure first, we walked in, there was nobody else there, and as our eyes adjusted to the half-light there in front of us were both the Kiwis! They were a lot bigger than we had expected, they stand about 18 inches tall and their bodies are roughly the size and shape of a rugby ball. We spent 10 minutes watching them forage in the undergrowth before heading back to the KawaKawa aviary in time to see that bird up close and personal too. That left us time for a quick walk around and through the other aviaries before we headed back to the car and hit the road. Two more ticks in our eye-spy book of wonders of New Zealand. As we neared Wellington Highway 2 turned west and we drove up and over the Tararua Mountain Range, it was a spectacular drive, quite steep in places and with some very long drops alongside us but the road was excellent and we crossed without incident. From there it was a straight run into Wellington where the road and the main railway lines follow the fault line that runs through the region, that gave me something to think about while Mark watched the traffic. Time was getting on but we just had time to drop our bags at the hotel before we drove across town to the Hertz office, we dropped the car of on an industrial estate and at the receptionists’ suggestion took a bus back in to town. Back at the hotel our bags had been delivered to our room and it took no time at all to check in. Time to explore. We left the hotel and headed toward the centre of Wellington, it wasn’t far, the hotel was in a great location and our room looked out over the NZ Parliament building known as the Beehive. As we walked along the road looking for somewhere to eat (lots of choices, we just didn’t know what we felt like eating) we bumped into one of the couples who had been on the wine tour in Napier with us and stopped to compare notes on the trip down (they hated the drive through the mountains, too steep and winding). As they headed back to their hotel we spotted a Belgian restaurant offering 2 for 1 moules frites; the Wellington/Marlborough Sound region is the heartland of the Green Lipped Mussel industry so this sounded like a good bet. We ordered a kilo of mussels each, washed them down with Hoegarten and followed up with waffles, the whole place was really authentic, we could have been back in Brussels. While we were in the restaurant a family of three from Melbourne who had also been on our wine tour came in a took a table, when we finished we went and said hello and had a long chat, they have invited us to visit them when we reach Melbourne next month. We had a free day on Tuesday to explore Wellington, we left the hotel and walked through town stopping for breakfast in a little café in a Victorian arcade. From there we headed to the tourist information Centre and then down to the quayside to visit the Te Papa Museum which everybody had recommended. 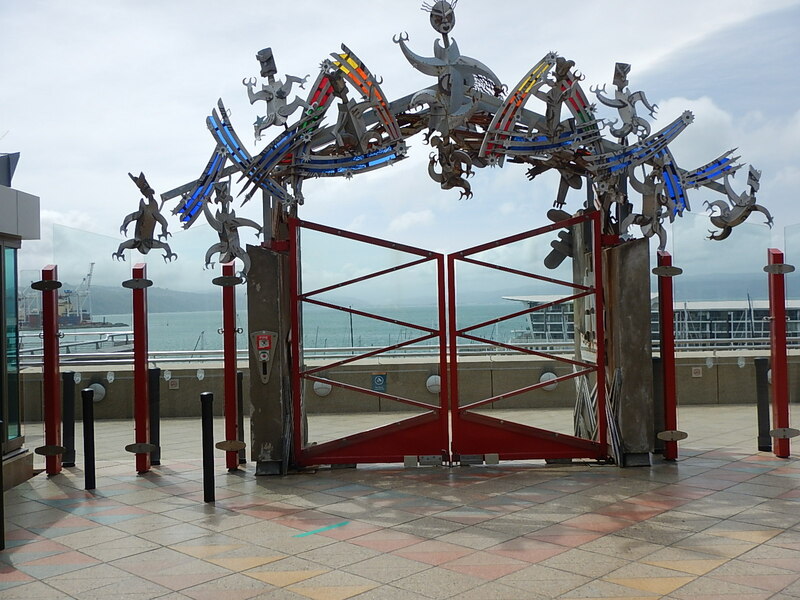 To get from the town to the waterside we walked across the City to Sea bridge, a combination of foot bridge and public square with lots of artworks reflecting Wellingtons location and its Maori heritage. Te Papa is the National Museum of NZ and is a modern building with six floors covering Maori history and art, the social history of NZ, geology and natural history, and the experience of immigrants coming to NZ from early settlers to current refugees. It was all very well done but the knock out exhibition was Gallipoli: The Scale of War. As we entered the gallery we were confronted by a model of a soldier kneeling in the sand, it was so lifelike it was unbelievable, you could even see the hairs on the back of his hand twitching in the breeze from the air conditioning, if that wasn’t impressive enough he was approx. 3x life size, a giant. The exhibition told the story of the Gallipoli Campaign in a series of five themed displays (an ordinary soldier, an army doctor, an officer, an artillery unit and a nurse) each one tells the story of a real individual and places them at a specific point in the campaign so you discover the big picture through one persons’ experience. Each gallery in the exhibition is introduced by one of the incredibly life like models. It is hard to explain why these models were so moving but it was a very powerful presentation. As we left the exhibition we were invited to write our comments on a poppy and place it at the feet of the final model, an infantryman in full winter battle dress, there were thousands of poppies around his feet, it was a very impressive sight. While we were visiting the exhibition we bumped into one of the other guest from the B&B in Napier!! After the exhibition we walked back to the hotel along the waterfront which has been regenerated as a social and recreational hub for the city with open spaces, cafés and restaurants, it is not very touristy just pleasant and relaxed, Wellington has a lovely feel to it and we really want to come back to spend more time here. On Wednesday we were booked on a guided walking tour of Gourmet Wellington, NZ is developing a really strong reputation for good food and Wellington is its heart. As instructed we arrived at our meeting point at 09.30 and were met by Fiona, our guide. We had been told that the tour group would be approx. 6-8 people but when we got there we discovered we were the only people booked so it turned into a private guided tour. First stop was Mojo Coffee Roasters; Mojo is a small chain of cafes with outlets in Auckland and Wellington, all the coffee is roasted and blended in one of the old waterfront warehouses on the quayside. We spent about an hour at the roaster watching coffee being roasted in 50kg batches and learning how it is blended for flavour, it was a perfect follow up to our visit to the coffee plantation on Hawaii where we saw the process up to the point of green beans ready for roasting; in Wellington we saw the rest of the process up to and including tasting the end result. Next stop on out tour was Gelissimo Gelato an artisan ice cream and sorbet maker. We were taken behind the scenes to a small kitchen no bigger than a domestic kitchen, it had two ice cream makers and three fridge freezers, from here the owner makes enough to supply three outlets of his own and provides a bespoke service to local restaurants working with the chefs to develop new flavours. It was a grey and windy day in Wellington (it had been a windy night too, our room was on the corner of the 11th floor and we heard every gust) so the shop was quiet, the young guy on the counter led us through a tasting of all 14 flavours on display in the freezer (tough job but someone has to do it!) and then invited us to choose one each to take with us, I was tempted by the Turkish Delight sorbet but though it might be a bit too subtle, the gorgonzola ice cream was fab but a whole portion might have been too much, in the end I chose the damson plum sorbet and Mark chose the pomegranate and berry. Clutching our sorbets, we set of with Fiona heading for Moore and Wilson a fresh food market which stocks the best of New Zealand produce, it is open to the public but its origin and focus was supplying local restaurants. When we arrived we sat down to sample a selection of NZ cheeses, crackers and chutneys, all very good. We then spent some time looking around, the fresh fish section was great as were the deli and the bakery, I was almost tempted to move to Wellington just to be able to shop there. Onwards… Eva street is a back street running behind an old shoe factory, it has become the hub of a group of young start up food companies and Fiona introduced us to a few of them. First was a bakery which opened on to the street so you could see the bakers hand kneading dough, 25% of their business is supplying their signature salted caramel cookies to local café’s, we are pleased to confirm that they are excellent. Next stop was Wellington Chocolate Factory, a fare trade chocolate company started just three years ago and already exporting to the USA, Canada and parts of Europe. Everything they make is made in the Eva Street factory and all the products are hand wrapped. We tried four single origin chocolates (Columbia, Puerto Rico, Peru and Papua New Guinea) and were amazed how different they were. Just around the corner was Fix and Fogg, described as a nut buttery, basically they make peanut butter and very good it was too. They have four products (they have only been going about three years) plain peanut butter in smooth and crunchy presentation, dark chocolate peanut butter (nice but not quite sweet enough for my taste) and Smoke and Fire, peanut butter with smoked paprika and chillies, it had a great punch and would make lovely satay sauce, sadly it’s not available in the UK but I wouldn’t be surprised if it is soon. Last stop was Logan Brown, one of the top restaurants in New Zealand who were waiting to serve us with a three course lunch (mercy!). Their signature dish is ravioli with Paua (abalone) served with a lime and butter sauce, it was delicious, we only had a taster but I have got the recipe. Main course was mushroom risotto with truffle oil for me and Mark had Kerala fish curry; we finished with dark chocolate crème with kiwi fruit sorbet. Each dish was accompanied by a different wine. What more can I say, it was a fantastic lunch. By that point we were pretty much ready to head back to the hotel and fall asleep but we couldn’t walk that far so we made it half way and then sat on the cable car that runs to the top of the hill behind the city. We got off at the top and admired the panoramic view before completing a circuit of the hill top loop through the botanical gardens. The trip back down in the cable car took longer than it should because the other car broke down and we got stuck half way back to the station, we were very happy to sit and wait for it to get going again. We finally made it back to the hotel where we spent a lazy evening watching TV and finished up the cheese and crackers we had bought from Napier. Do Mojo accept Costa loyalty cards?? Afraid not but nice coffee!